New for 2015! Some trails have an Early (8AM) and Late (10AM) departure time. Departure times are not inter-changeable, please show up for the departure time you sign up for. Unless indicated otherwise - all trails depart at 9AM. Easter Jeep Safari consists of trail rides, mostly day long trips, departing from Moab Utah throughout the 9 day long event. Full information about the Safari is available in a colorful newspaper. Click here to request paper. The official event is hosted by the Red Rock 4-Wheelers Inc. one of the the local four wheel drive clubs of Moab. Participants provide their own four wheel drive vehicle, take care of their own food and non-alcoholic beverages for the trip. Suggested essentials, beyond plenty of water, include sun protection, and layered clothing in case of changing weather circumstances that are always a possibility during the spring in southeastern Utah. Note: There may be trails available at the time of the event. You can check at the registration desk at the Spanish Trail Arena during the hours it is staffed to inquire as to the last minute availability. There are no registrations at the trailhead line up. Mailing of the Jeep Safari newspaper is usually done each January and is specific for each years Safari. If you would like to receive a copy of our 90+ page Easter Jeep Safari magazine please click here to request to have your name added to the mailing list. You will receive the magazine a few weeks after we receive your request. Once you are on our mailing list we will keep your name active for five years. There are complete details on the policies and cancellations in the Safari magazine and on this website. (View 2015 Paper Online) You may want to consider making travel arrangements at your earliest convenience as hotels, motels and campgrounds fill up quickly. In 2015, ALL registrations will be handled on this website. No paper registrations will be used this year and future years. The overwhelmingly great response to the online system in 2013 and 2014 (over 98% of registrations came in on the website! ), made the decision fairly easy to finally let the paper system go away. GROUPS - Gather your group together to decide what you want to do then everyone get on the web site and register while there are plenty of spaces on the trails you want. Though not an exhaustive introduction to the Easter Jeep Safari event, we hope this provides an overview to many of the pertinent questions that are asked throughout the year. The Jeep Safari newspaper encompasses these points in greater depth, and also holds the registration form, so be sure to write in your request to be on the mailing list. Thank you for your interest in EJS, the official event of the Red Rock 4-Wheelers! What it is.... Easter Jeep Safari consists of trail rides, mostly day long trips, departing from Moab Utah throughout the 9 day long event. 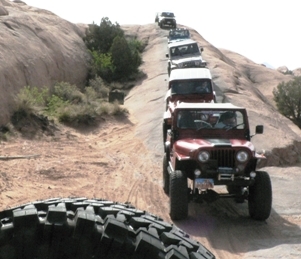 The official event is hosted by the Red Rock 4-Wheelers Inc. one of the the local four wheel drive clubs of Moab. Participants provide their own four wheel drive vehicle, take care of their own food and non-alcoholic beverages for the trip. Suggested essentials, beyond plenty of water, include sun protection, and layered clothing in case of changing weather circumstances that are always a possibility during the spring in southeastern Utah. What do we do? The club "plans the routes and shows you the way". 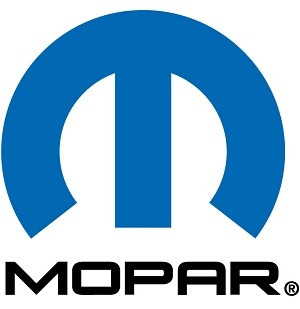 There are no restrictions as to what type make or model of vehicle is used even though the name - dating back to the mid-60s uses the term "jeep", but high ground clearance and 2 speed transfer cases are expected in what ever type of truck you run. NO ATV's or UTV's. Where we go? The club official runs usually total around 9 different locations every day, with "Big Saturday" culminating in the largest ever single trail ride departure happening - around 30 groups line up in down town Moab to head off in every direction for 30 different trails! What types of trails? There is truly something for everyone here in Moab Utah. That is why it is referred to so often as the Mecca of 4wheeling! A few trails are nearly accessible for 2 wheel drive vehicles, while the most difficult runs require seriously modified vehicles - and even then, chances for breaks and body damage still exist. Be sure to check each year for the available run lineup. RULE 1: "A vehicle must have an integral metal top or roll bar to participate in Jeep Safari and have a street legal license from the registered state." RULE 2: "Vehicles must have safety equipment adequate for legal operation in Utah. We mean seat belts, and we urge everyone to use them. Having proper brakes, lights, etc. is implied in this rule and should go without saying." RECOMMENDATIONS: We recommend that each vehicle carry a fire extinguisher, first aid kit, tow strap, spare tire, and a jack. What about Permits? All of the trips travel across federal and Utah state lands on established roads, and even through some private land sections. Most road/trails are left over from the mining days which provided a boom to the area in the 1950s. STAY ON THE TRAIL/ROADS. The organization files the required permits according to the number of participants in each group, and pays the associated fees which are included in the cost of registration. The "Special Use Permit" at the time of writing this, is $5 per day per person. This number has reached tens of thousands of dollars in land use fees paid to the BLM and the State of Utah in recent years. It is critical that participants respect the land and follow the leaders staying to the designated route. This is absolutely essential for anyone visiting the backcountry in and around Moab Utah throughout the year. What is involved and How do I register? The cost is $50/vehicle for each day. Updated and improved for 2015 - pre-event On-line registration on this website. As the event has grown to be very large, on line registration was inevitable. The magazine is usually mailed out in the beginning of January each year. Full details and instructions on how to proceed and the costs associated are in the magazine. Registration at the event may be possible. During EJS, if trail limits have not been met, then these spaces can be available for on site registration (at the Spanish Trail Arena) on a first come first serve basis at the discretion of the organizers. (Some registration will still be available on-line (on this website) if the trail day has not been closed by Registration officials, (every day when registraton closes for the day the next days trails will be closed to new on-line registrations - this allows us to prepare paperwork for Trail Officials for the next days trail ride. You may still come into the Registration area the next morning and register for the trails that day). If you register On-line on this website you will receive immediate confirmation of your registration by return e-mail. All participants must check in with the organizers at the Old Spanish Trail Arena during the event to receive the event package which will include a trail pennant, a raffle ticket, a dash plaque, and any required additional information. Day of event registration and package pickup is available at the Spanish Trail Arena in the upper level rooms from 7am to 9am each morning of the event (except Big Saturday and Easter Sunday), and open all day til 8pm on Thursday and Friday when the Vendor Show, raffle, and Boy Scout BBQ are held at the arena as well. Cancellations? Understanding that things happen, we try to be flexible, but we have to use a system that we can manage and one that discourages careless changes that threaten the plans of others. A cancellation (any or all trails), if received in writing (mailed or e-mailed) prior to March 15, 2015 merits a refund of all but a $15 cancellation fee. After April 1st, openings will not be filled, and fees will be forfeited. Refunds will not be made until after Safari and our treasurer has handled the more pressing Jeep Safari business - please allow up to 4 weeks for processing. ALL fees are forfeited after Safari begins on March 28, 2015.
Who are the Trail Leaders? They are Red Rock 4-Wheeler members who do this for the fun of it without payment for their services. The trail leaders are experienced four wheelers who have been guiding the runs for many years and come to Moab each year from 17 states and 3 foreign countries. In addition to the leader, there are also additional volunteers in the middle and at the end of the trail group (tail gunner). What is the Vendor Show? On Thursday and Friday of the event week, there is a vendor and information display area that is free to the general public. This is held inside and out at the Spanish Trail Arena south of Moab on highway 191. To have booth space whether in or outside of the arena, you will need to contact the Easter Jeep Safari Vendor Event managers for availability and arrangements. (Carma @ 435-259-1916) Booth space is a set fee (Click here to request forms) or comparable value product donation for the tremendous raffle that is drawn on Friday night. At this time there is only 1 ticket provided per registered participant for the raffle, an added incentive to be a part of the official EJS event - the 'ticket' needs to be present to win. In addition to the four wheel drive parts and accessory companies and the enthusiastic tire manufacturers that display their latest products at booths, in trailers, and with 18-wheelers, companies that sell products and accessories directly at the show are also on display with items for sale. Special interest groups also provide information for those interested in the future of four wheeling.